Microsoft released a boatload of patches for various flavors of Windows 10 via Cumulative Updates (CUs). Read More. Microsoft may want to consider renaming the now-infamous Windows 10 October Update version 1809. First it had to be pulled from the public due to critical file-deleting bugs. Then it was finally reissued in the middle of November. This default apps bug is still broken. Machines with Intel HD Graphics drivers are losing their sound (again). iCloud syncing is broken. And now Microsoft says Windows Media Player is broken in the latest cumulative update. NOV 13, 2018 – Microsoft resumes rollout of October update. This comes after having to pull it last month just days after releasing it as it was causing customers to lose data. That said, tread cautiously with this update. To have more control over with automatic updates are applied, see this page on our site. NOV 2018 – Microsoft has reportedly paused this update v1809 referenced below until the bug is corrected. 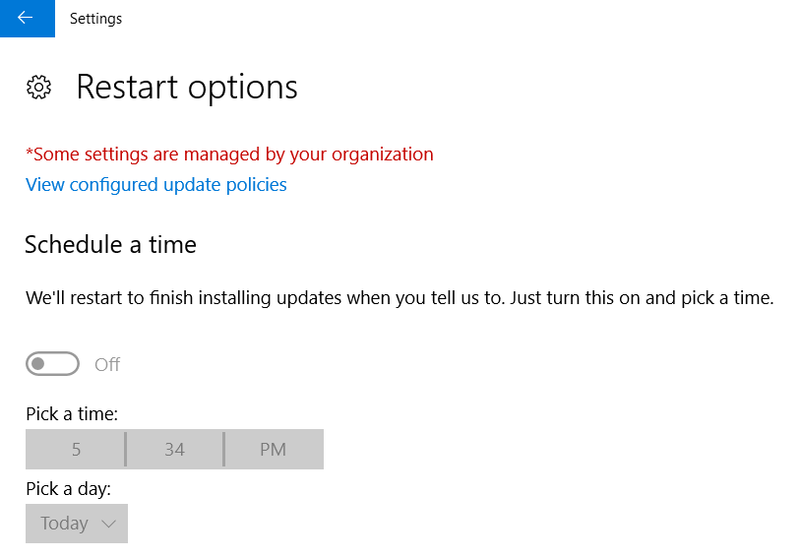 If you want to be in control of Windows 10 Updates, you can turn them off here. OCT 2018 – Many customer are reporting recent Windows 10 updates are automatically rebooting their computer, in the middle of the day and without warning. This can happen when you least expect it without giving you the chance to close or save your work. Thanks again Microsoft. To avoid rebooting in the middle of the day here is the setting where you can turn that OFF. Note this setting applies only to Windows 10 before version 1803. To see which version you have, go to Start / PC Settings and in the right column click on OS Build Info. It will tell you which version of Windows 10 you are currently running on. For Windows 10 version 1803 and higher this option was removed by Microsoft unfortunately. 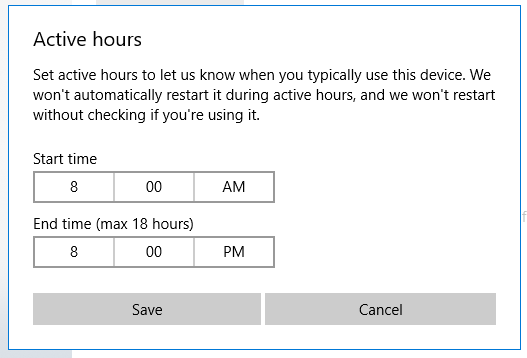 The Restart Options was removed starting in version 1803 of Windows 10, and replaced with Change Active Hours setting. Perhaps Microsoft found and fixed the auto reboot without warning. note the last sentence. “…we won’t restart without checking if your’re using it“. Hopefully that is the case we will let you know by updating this page if this problem is corrected in version 1803 and higher. If you are sick of Windows 10 automatically updating your computer you are not alone. Learn how to Turn it OFF here. October 2018 – BEWARE ! This new update is causing a serious problem. One that can’t be reversed. If you’re not enthusiastic about potentially losing all of your data in your USER folder such as My music, My Pictures and My Documents etc Read this now! Note the latest solid Windows 10 update as of this writing is version 1803. To see which version you have, go to Start / PC Settings and in the right column click on OS Build Info. It will tell you which version of Windows 10 you are currently running on. If you’ve upgraded to Windows 10 and now your keyboard has stopped working particularly on laptops, you’re not alone. Many other Windows 10 users are reporting the same problem, especially after installing the Microsoft KB4074588 . If your keyboard has stopped working see this page for steps on how to fix it and prevent it. DEC 2017 – You may have noticed that your system took a very long time to complete a Windows 10 update. This is because Microsoft recently rolled out a major Windows 10 update called “Windows 10 Falls Creator 1709“. This major update has been a bumpy ride for users, see their biggest complaints here. If you have a newer computer this may not be an issue for you. If you have a computer that is more than 4 years old, this update may cause lots of issues with your computer, video or other peripherals. Here is what you need to know about that. OCT 2017 – New Microsoft update may cause Windows 10 systems to go into a reboot loop. Read this fix now. 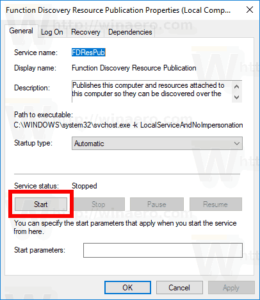 Also see how to turn OFF Auto updates in Windows 10. Press Win + R to open the Run dialog. Type services.msc in the Run box and hit the Enter key. 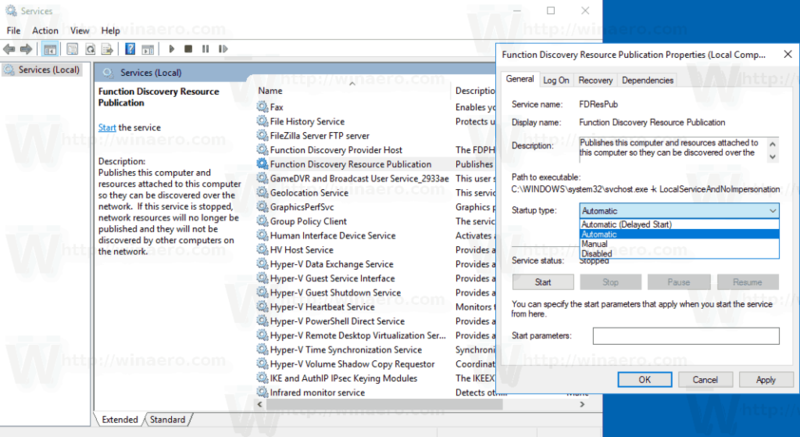 In the Services window, scroll down to the Function Discovery Resource Publication service. 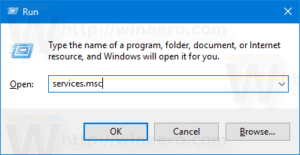 Double-click it to open its properties and set its startup type to Automatic. It will be the longest lasting computer you have ever owned!